Wraysbury Skiff and Punting Club | What is punting? You are here: Home » What is punting? Most people will conjure up the vision of the undergraduate at Oxford or Cambridge, a girl with a parasol, a picnic hamper and champagne but, racing punts are as little as 1ft wide and need tremendous skill and balance to propel them at surprisingly fast speeds. Racing punts come in two types, defined by their width. There are 2ft wide racing punts, which are always raced in matched pairs like the skiffs, and then best & best punts, which can be as little as 1ft wide and are all individually made, originally to suit the particular owner. Events for 2ft’s are for doubles and singles, while best and best events are just for singles. There are also events for punting in Canadian canoes and dongola races in punts that are 3ft wide for crews of four men and two ladies, where the punt is paddled canoe style, rather than poled. Punts are propelled by punt poles. Although originally wooden, these are now made of hollow aluminium tubes with a cast aluminium shoe on the end to press into the river bed. All types of punt carry two spare punt poles in case they are lost during a race, for example by being stuck in a muddy bottom. 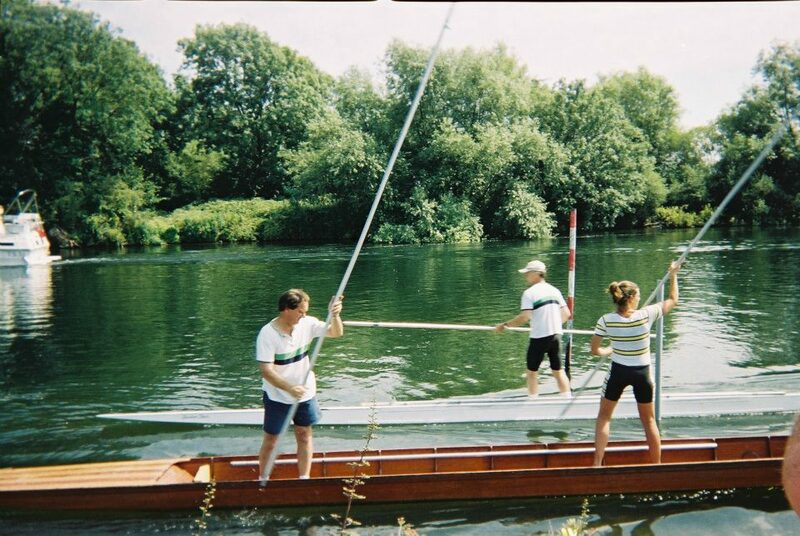 If you loose all your poles in a race, a competitor may resort to paddling with their hands or gratings from the punt to finish the course or to return to a lost pole. Events are offered for Men, Women and Mixed crews. You start with a status of Novice and with sufficient wins at each status, can move through to Senior. You have a separate status for each of the disciplines; Singles, Doubles, Mixed Doubles and Best and Best. Races are also offered for Juniors and Veterans with handicaps on time based on the age of the crew. A typical sprint course is either ½ or ¾ of a mile in length. The race is conducted over a series of ‘legs’, each end of the course being marked by a pair of wooden poles called “rye pecks”. They are secured to the river bed by a metal spike that is attached to one end. The highlight of the punting season is the Punting Championships held at Maidenhead in August. These championships have been contested since 1886. The Club’s original benefactor Eric Haines was the Professional (as distinct from Amateur) Champion in 1948. The sport is administered by the Thames Punting Club.